498: How To Avoid Becoming A Junk Food Vegan! For the most part I’m beyond excited to see the explosion of vegan options becoming readily accessible globally. Times are changing and that is AWESOME however it also means there’s the potential to let some sneaky unhealthy health foods creep into your plant based diet. You see one of the lesser acknowledged misconceptions of a vegan / plant based diet is that by default it’s healthy. In fact that’s just not true. 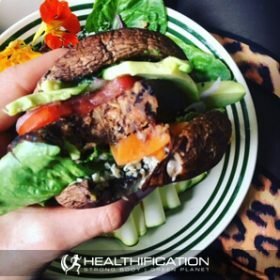 If you were to ignore Michael Pollens advice: “If it came from a plant eat it, if it was made in a plant don’t” you could easily get lost in a sea of vegan donuts, vegan burgers… pizza, cheese, ice-cream and everything else that once addicted you as a carnivore and now is conveniently accessible in plant based form. In todays show I’m sharing: How To Avoid Becoming A Junk Food Vegan! Step One: Set Some Boundaries. It’s super tough to stick to even close to ideal if you’re yet to clarify what ‘ideal’ is for you. You’ll need to decide on what resonates with / and is sustainable for you however here are some of my boundaries that let me enjoy huge delicious, nutritious plant based meals with the odd splurge and without ever feeling guilty or out of control with my eating. Keep refined carbs to the weekend. Include green veg and plant based protein in every meal. Steer clear of empty / nutritionally void calories. Have a weekly alcohol quota. Step Two: Learn From Your Mistakes. The running tally is a strategy I implemented after recognizing that time and time again I’d demolish excessive amounts of particular foods. For me this is roasted nuts. Roasted nuts certainly are not a junk food however you can have too much of a good thing. And I did… often! The running tally means you have a general idea of how much you’d like to consume in a day and a week and then when you go over one day it comes off your quota for the next day. Social pressure can be a delicate negotiation particularly for you if you’re eating plant based for your health primarily rather than for ethical reasons. Perhaps your best health should be a non negotiable however we all know from experience it’s not. The “just one little…won’t blow the diet” can wear down your defences in a way that more likely “just one little slaughtered animal….” won’t. Getting super articulate on communicating in a non-judgemental way WHY you’re choosing to eat as you are. Bringing your own (with enough to share) plate of deliciousness to meat focused gatherings. Carrying portable protein pimps (like nuts, seeds and nutritional yeast) to places where an overly light dining experience might be on the cards. Calling the restaurant ahead of time when you’re not sure if there will be vegan options. Planning your meals and doing weekly food prep so you’re less likely to get caught short in that crazy-irrational-hunger mode where quick, easy, fake might be your go to choice. Because now there is (for better or worse) quick easy fake vegan! Step Three: Refine Your Healthy Junk food Options. Swap burger buns for 2 portobello mushroom caps. Swap nacho chips for kale crips and taco shells for cos and cabbage leaves. Make a cauli-crust pizza (I’ll link to my fav recipe in the show notes) or even easier a portobello cap pizza. 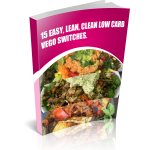 Add generous stacks of veg / salad to your healthy junk food meals… you can never get enough fibrous love (!) and it’ll help fill you up without demolishing excess amounts of the other stuff. The main thing, as always is to focus first on what you’re giving your body. To first, Set Some Boundaries. To be willing to, Learn From Your Mistakes. And to continually, Refine Your Healthy Junk food Options. To get actionable today is there a regular Junk Food Vegan meal in your week that could do with a little refining? Or actually more to the point the goal is likely to get it a little LESS refined! That’s it for this week in Healthification. Huge gratitude to YOU for sharing this week with me. The Healthification podcast is proudly bought to you by my FREE ‘Easy Vegan’ plan. It took me 25 years to transition from a meat eater to a happy, healthy, non-judgemental Vegan! You can do it in 7 short days with my simplified ‘easy vegan’ plan! Get the fit, strong, and healthy plant based body you deserve… while avoiding ALL the mistakes I made along the way! If you liked How To Avoid Becoming A Junk Food Vegan you’ll also like: Creating Your Ideal Plant Strong Day.